The recommendations appearing in this document should be regarded as a general guide only. The exact fertilization program should be determined according to the specific crop needs, soil and water conditions, cultivar, and the grower’s experience. For detailed recommendations, consult a local Haifa representative. Haifa fertilization recommendations are available online. Click on http://www.haifa-nutrinet.com to enter into NutriNet™, a unique software program, that will assist you to workout the recommended fertilizer rates at different growth stages according to the expected yield under your growing conditions. Fertilization and fertigation rates may vary according to cultivar, growing method, climatic conditions, growth stages and expected yield. By using Haifa NutriNet™ (http://www.haifa-nutrinet.com) program on-line, you may obtain Haifa’srecommendations most suitable to your growing conditions by selecting the expected yield, growing method and growth stages. 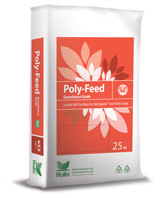 Foliar Feeding: To boost growth apply Poly-Feed™ Foliar Vegetative Booster every 15 days. Volume: 200 L/ha. Concentration: 0.5% - 1%. To cure and prevent magnesium deficiencies, apply Magnisal™ by Nutrigation™ or foliar spray. To cure and prevent calcium deficiencies, apply Multi-Cal™ by Nutrigation™ or foliar spray. An N:P2O:K2O ratio of 2:1:3* is recommended, as pre-plant application. This application will take care of the nutritional requirement of the plot for the entire growth season. Multicote® Agri granules should be incorporated into the soil, 10cm deep and 10cm away from the planting row. Consult a local Haifa representative for detailed explanations and instructions. * The actual choice of formula should take into account soil type and addition of compost and any other factor that may affect the nutritional status of the soil. Foliar feeding is a fast and highly effective method of supplementing and enriching plant nutrients when needed. Foliar application of Haifa water soluble fertilizers provides needed plant nutrients for normal development of crops when absorption of nutrients from the soil is disturbed, precision-timed foliar sprays are also a fast-acting and effective method for treating nutrient deficiencies. Foliar application of the correct nutrients in relatively low concentrations at critical stages in crop development contributes significantly to higher yields and improved quality. Dissolve Haifa water-soluble fertilizes in about half of the tank volume, and add to the spray tank. When applying together with crop-protection agents, addition of wetting agents is not necessary. To ensure compatibility of tank-mix components, a small-scale test should be performed prior to actual application. There are different growth media with different physical and chemical characteristics. The following are general fertilization recommendations for all soilless growth media. Fertilizer stock solution: Once dissolved, not all fertilizers are inter-compatible with each other. Therefore, they have to be split into two fertilizer tanks: A and B, according to their compatibilities. Fertilizers containing phosphorus (P) or sulfur (S) should be dissolved in Tank A only, while fertilizers containing calcium (Ca) or magnesium (Mg) should be dissolved in Tank B. Chelated micronutrients should be dissolved in Tank B, as well. Dividing the injection capacity by one cubic meter should be the concentration of the fertilizer solution. If, for example, the injector delivers 5 L into each cubic meter of the irrigated water, multiply the amount of fertilizer dissolved in the tank by 200 (1000 L / 5 L = 200). The following example was prepared to fit Dutch conditions (low transpiration and low water EC). Considerable and proportional reduction in the concentration of the macronutrients should be required to offset for lower quality water prevailing in other conditions. Table 18: Nutrition database for tomatoes. Growth medium: rockwool. * Ca, Mg, and S concentrations may vary depending on Ca and Mg concentration in water and amount of sulfuric acid used for acidification. Some acid and Multi-Cal® calcium nitrate should be added to adjust the pH and to complete calcium requirements.